Oogie Boogie is, simply put, a troublemaker in every aspect. He's all bugs and no brain, literally! He is critter incarnate, with hundreds upon thousands of them coming together to make up the bulk of his body, held together by a tattered old sack. He thrives on making life difficult for Jack and the townspeople, and is quite egoistical, to say the least, and loves gambling. Oogie first becomes involved when Lock, Shock and Barrel relay the news to him about Jack's plans for the Heartless Festival, or more specifically, of the heart that was being made. He commands them to steal it and deliver it to him, believing that it would grant him the powers he'd always dreamed of having. Once the heart was in his possession, he swallowed it before everyone's eyes, and called out to the Heartless to aid him in battle, though it was futile as he saw his defeat at the hands of the party. He later submits to the power of darkness and fuses with his once proud manor as a last attempt at victory, but no matter how hard he tried, he was no match for the protagonists. 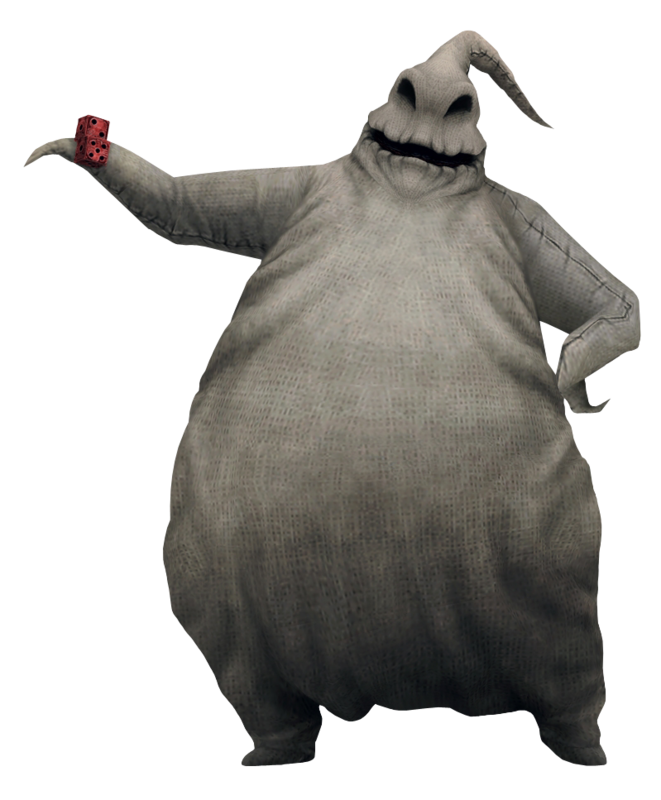 Oogie Boogie is as nasty and as slimy as a bag of wriggling bugs, an object he literally personifies. Filled with ideas of vengeance following his defeat at the hands of Sora, Donald and Goofy, this miscreant will stop at nothing to exact a cunning plan. Oogie's time is short-lived as he is revived from death by the evil Maleficent as a plan to give Sora's troupe something to worry about. At first Oogie is full of energy and brimming with plans of badness and ideas of flattening Sora to the floor, but his enthusiasm quickly burns out and he is whisked away by Maleficent to recover. Once he regains energy, he kidnaps Santa on Maleficent's orders and ties him to the conveyor belts in Santa's own workshop with plans of turning him into a giant Heartless. Fortunately, his gears grind to a halt when Sora and co. with the aid of Sally successfully rescue Santa and send Oogie back into the realms of hell.